The care of the coat varies and depends on the breed. 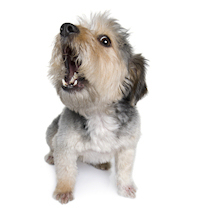 Short-haired dogs require brushing while Terriers coats are plucked to remove dead hair. They may need some brushing and combing in between the plucking. Longhaired dogs are combed and then brushed. Regular brushing and grooming keeps the coat tidy. It also helps when the dog is shedding or losing its hair, which it will do once or twice a year. It keeps the dog clean and free of dander and helps to stimulate circulation. Brushing twice weekly is recommended, but daily brushing is the best. Mats are common and can sometimes be removed by teasing or picking apart with one or two teeth of a comb. Often they must be cut out but this must be done carefully so the skin is not cut. Mats are usually found behind the ears or under the legs of dogs with long hair. 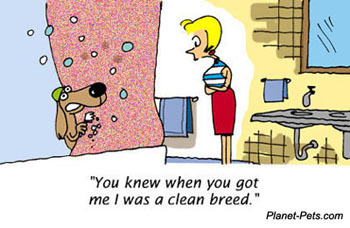 Baths are only necessary when the dog is very dirty or carries a bothersome odor. Over washing can remove natural oils and the dog’s coat can become dry and brittle. Only use a mild soap and one that is recommended for dogs. Make sure all soap is rinsed from the coat. Try to get a towel around your dog immediately, as he will shake to remove any excess water. If the weather is cool or windy keep the dog indoors until dry. You can maintain his cleanliness by brushing and combing on a regular basis. Nail trimming is another part of regular grooming. The nails are cut so they are just above the floor. Many dogs dislike this procedure and for a small fee this can be done at the veterinarian or groomers. If you do it yourself make sure you use the specially designed nail trimmers. These can be found at your local pet shop. Only the hook portion of the nail is removed and in dogs with dark or pigmented nails where the vein does not show, it may be best to have your vet or groomer do the trimming. 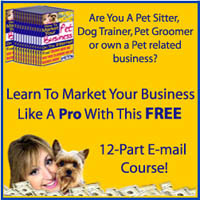 If you walk your dog often and the surface is concrete you will find trimming to be minimal. Otherwise, about every two months should do. Go here for instructions on nail clipping. The ears of dogs are sensitive (go here to read about ear problems). Care should be taken to avoid getting water or soap in the ear when bathing. Putting cotton in the ear prior to a bath works well. Do not use alcohol in the ear. Ear infections are more commons in dogs with lop ears or hair-filled ear canals as opposed to dogs with upright or erect ears. This is due to better circulation of air in the erect ear and it is able to dry out. Always check the ears after bathing and be sure to dry with cotton or a very soft dry towel. Remember the information given is only a guide and you should always check with your veterinarian if you think there is a problem or before administering any medication.